Tower Grove Park is a public park and arboretum maintained, operated, and programmed by an independent Board of Commissioners and staff. The Board of Commissioners receive support from private donations, grants, rental fees, the Friends of Tower Grove Park, and the city of St. Louis. The Tower Grove Park staff is the only provider of maintenance for the Park. Tower Grove Park’s landscape of grassy meadows, approximately seven thousand trees and many varied flowerbeds make the park an important urban green space. The Park is a premier urban and historical destination, and is maintained through an annual park maintenance program, an urban forest renewal program, and an array of free and low-cost educational, recreational, cultural and social opportunities for schools, neighboring communities, and the St. Louis region. Cultural and educational programs include the Summer Children’s Concert Series, the Tower Grove Farmers' Market, lecture series, art exhibits, and band concerts. Victorian pavilions are a favorite site for family, school, and community events and celebrations. The Stupp Center offers recreational, educational and social activities for seniors. Well-maintained trails, tennis courts and athletic fields are busy year-round. The Park’s wading pool and three playgrounds are well-maintained, safe, and fun family gathering places. 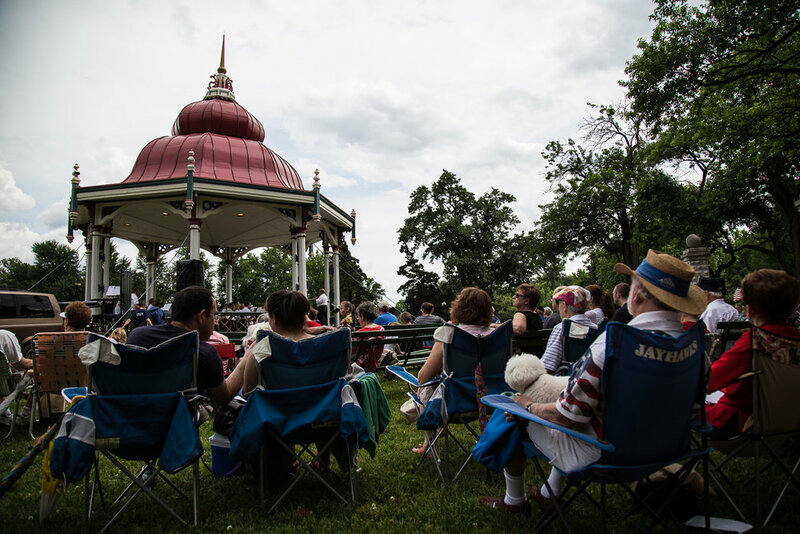 The Piper Palm House provides a free public venue for three St. Louis Symphony performances each year, and the historic Music Stand hosts ten Compton Heights Concert Bands performances each summer. Tower Grove Park annually serves approximately 2.5 million children and adults of diverse races/ethnicities and socio-economic backgrounds from the St. Louis region. The majority of those served by Tower Grove Park are residents of nearby neighborhoods in the city of St. Louis. Twenty-five percent of residents in the Park’s zip code (63110) live below the poverty level. In fact, support from the city of St. Louis only comprises a portion of the Park’s budget—nearly $1 million additional dollars must be raised each year from private donations, grants, and rental fees in order to sustain Park operations. Your support, whether as a Friend, Society Member, or Corporate Friend, makes a difference in our ability to keep the Park green, safe, and beautiful each day. Please consider making a donation today, and feel proud during your next run, walk, game, or picnic that you are a part of Tower Grove Park. For more information, please contact our Development Director at (314) 771-4484.